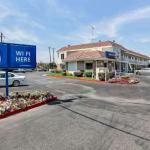 Low-priced rooms and a location one mile from the airport are the major features of Motel 6 San Jose Airport which also offers free parking laundry facility and light rail access to downtown San Jose. The Motel 6 has 75 rooms in a two-floor building with exterior corridors and no elevator. Rooms feature expanded cable TV and Wi-Fi (for a fee). Non-smoking rooms are available. The hotel also has a laundry facility free lobby coffee 24-hour front desk and free parking. Pets are allowed. The Motel 6 is on North 1st Street next to the Karina Court light rail to downtown San Jose and one mile northeast of Norman Y. Mineta San Jose International Airport. The San Jose Sharks bite or rather play at HP Pavilion three-and-a-half miles south in downtown San Jose. Ride the roller coasters at California's Great America five miles northwest.